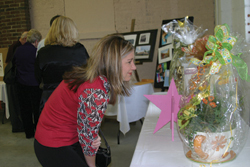 ENGLISH, Ky. (November 2011)  Carroll County Chamber of Commerce members were serenaded to Elvis tunes, a Silent Auction and a delicious dinner Oct. 13 at the organizations 14th Annual Awards and Recognition Banquet. This years theme was Rockin Through the Years, and the event was held at a new location: the Old English School House in English, Ky. Annual Dinner on Oct. 18. Elvis impersonator Todd Bodenhemier of nearby Oldham County entertained the capacity crowd of 225, and the Silent Auction raised $3,545  $1,000 more money than last year, according to chamber secretary Bret Calhoun. Proceeds from the events are used for scholarships to area graduates. This years scholarship winners are Travis Spenneberg, Jaclyn Glauber, Haley Hendrick, Dallas Wheeler, Daniel Wheeler and Steven Kelley. 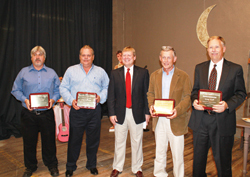 Several awards were presented to various businesses and individuals for their contributions. Chamber Board President Mark Smith presented the awards during the business portion of the evening.  Beautification Award: Down on Main Street restaurant, 508 Main St, Carrollton. Owners are Forrest and Rhonda Welch. This award is presented to a business that continually improves the quality of their business through landscaping, renovation, expansion, facade improvements, signage or other curb appeal projects to enhance the appearance of their property.  Community Impact Award: McNeals Trustwor-thy Hardware, 123 Fifth St., Carrollton. Owner is Brad McNeal. This award is presented to a business, industry or organization that has contributed to the quality of life for the residents of Carroll County.  Raymond Ray Community Service Award: Greg Goff, president and CEO of First National Bank of Carrollton. Goff is a former chamber president. This award is presented in memory of Raymond Ray, whose volunteer hours contributed to the success of several community organizations and events in Carroll County.  Business Hall of Fame Award: Craigs Do It Best Rental Center, 1691 Hwy. 227, Carrollton. Owner is Kevin Craig. This award is presented to a business that has been open for 50 years or more and operated under the same ownership.  Chamber Appreciation Award: Chamber secretary Bret Calhoun, who won a statewide newsletter award.  Friend of the Chamber Awards: Lisa Brown, general manager of Wal-Mart of Carrollton, Jessie Harris, marketing official with the Kentucky Speedway, and local resident, photographer and NASCAR fan Jimmy Supplee for their help in preparing the city to host the inaugural NASCAR Sprint Cup race last July.  Friend of the Chamber Award: Nancy Jo Grobmyer, the first female city council member who served in that capacity for 37 years.